Remove dirt and debris from small seams and crevices safely and easily! Easy to grip plastic handle with grooved "finger-grips"
Remove contamination from virtually inaccessible areas of your carpet and upholstery! The "finger grip" plastic handle allows you to easily grip this brush and wipe away the contamination from hard to reach areas. It especially comes in handy when working around the leather stitching, dashboard, console, buttons, seat crevices, fabric seats, trim pieces and more. 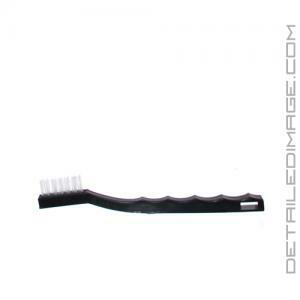 The bristles reach deep into the crevices, removing contamination that was previously trapped. It's the perfect tool for any detailer to have on hand to clean those problem areas. 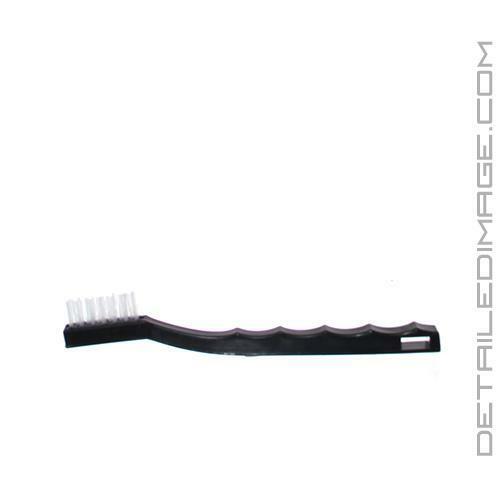 Pick up the Toothbrush Style Detail Brush if you are looking for the best way to clean out seams and crevices in your car's interior! Horse Hair - Soft and delicate bristles are best used on your sensitive areas of the car (i.e. dashboard, leather seats). Nylon - Strong and tough bristles are best for highly contaminated areas (i.e. carpets, fabric seats). This review is for the nylon brush. Its handle and head are well made and fit hand well. I use this brush for cleaning more durable areas that need something a little more robust than natural fiber bristles. Pros: durable and cleans up easy after use. Cons: none. I purchased the horse hair version of this brush. Its great for interior or exterior use with various cleaners. Gentle enough for delicate surfaces but can also use for deep cleaning of engine bay as well. Pros: bristles are soft and handle is well made. Cons: none. Definitely get this brush (horse hair version). Nice, soft and supple bristles give you confidence when using it. If using on heavily soiled surfaces, don't expect it to lift all the grime. But works well for most surfaces in the interior of your car. Especially well on the leather stitching. Overall - great brush, doesn't shed and will work a nice lather with the proper cleaning product. The nylon version would be better for more heavy duty cleaning. Getting both versions seems like a winning combination (will order the nylon version during my next order). Thank you so much! Just starting my business with you guys recently and I am very impressed, you guys will be definitely seeing me with future purchases!